I’ve been on a personal quest for a number of years to find that perfect blend of music and literature. We often use the same language to discuss both (themes, beats, movements, rhythm, etc) and I’d love to find a musical composition in a written work as well as a complex story in a composition. This graphic novel, Instrumental, by Dave Chisholm, does it quite well … though it does have the advantage of adding a layer of art to the story-telling. Not surprisingly, this is essentially a re-telling of a quite famous story … Faust … which has had its musical interpretations as well as literary re-imaginings. It makes for a great attempt to blend the sound and the story-telling. Tom is a trumpet player. He plays in a band with fellow musicians of better than average skills. Most of the band-mates are satisfied with their regular gigs and the ability to play, drink free beer, and shoot the breeze. But Tom wants more. As a true artist, he strives to find meaning in his art and to bring that meaning to more and more people. He wants to be able to touch people with his art and he becomes more and more irritable in his daily life because he’s not finding meaning. And then someone hands him the magic trumpet. Of course he doesn’t know that’s what it is. In fact, it looks pretty beat-up. But the stranger insists he play it. And when he does, he is carried away – propelled into the art he’s been seeking. And those who hear him are also transformed by his music and the band becomes more and more popular as fans come to be transported by Tom’s horn. But mishaps seem to follow Tom around and there are thugs looking to take the horn away and return it to someone else. Tom’s life becomes dizzyingly out of control by his art and a horn possessed. Author Dave Chisholm crafts the story well, letting it build, reach a fevered peak, and withdraw, just as a good musical composition would. In fact, Chisholm has provided a musical underscore (to this ARC reader, at least) that mirrors the story’s flow and emotion. The art is black and white, slightly stylized, and works well for the story at hand. It is a bit uneven, though. There were times … a panel here and there … where the art looked rushed or tired or as though Chisholm had a plan but not the skill to make it happen. The story, as I mentioned at the top, is pretty straight-forward and a retelling of Faust. The moment the old trumpet makes an appearance we know what’s going to happen to Tom and to those around him. There are no surprises here. So why read this? For that blending of words and music that I mentioned at the top. Chisholm is going after something. Something that had him reach out in a genre and a format that he’s not usually suited to. But like Tom, Chisholm seems to be chasing something bigger than his usual audience and to do so he’s needing to compose, write, and draw. Kudos for taking all of this on. Where Chisholm really shines, however, is in his music. Even before I had access to the special score he created for the graphic novel, I checked in to listen to some of his other music and it’s a smooth jazz, very reminiscent of the Chuck Mangione sound of the late 1970’s. It’s a sound I absolutely love and Chisholm has a new fan/follower for his music because of this graphic novel. As a score for the book, the music is unusual, but a nice underscoring. Underscoring. It’s a subtle, mood-evoking sound, but it is not a second telling of the story. It is a nice blend of music, art, and story, but it still doesn’t quite bring forth what I am searching for. I liked the book as an intelligent graphic novel – it’s a nice way to spend an hour reading. But it doesn’t offer anything new and I’d prefer to listen to Chisholm’s music work. Looking for a good book? 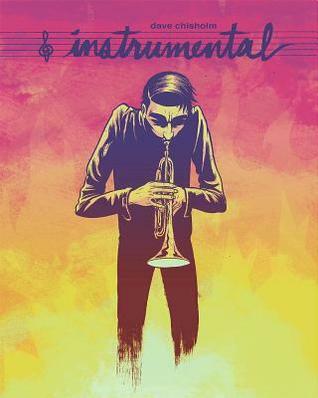 Instrumental is a graphic novel by musician Dave Chisholm that offers a nice blend of story and art (and music) but it’s an old story only moderately updated.